Taxes can be tough. Small businesses typically have small budgets, so hiring a professional accountant can be expensive. Using tax software saves cash and helps avoid getting taxes wrong which can create headaches further down the road. Tax software also saves time, and after all, time is money. In this review, we’ll look at TurboTax and ask if it’s a smart choice for small businesses. TurboTax is a popular option – it’s arguably the market leader heading into 2019 – but does the quality of this tax software justify its popularity or the price point? Is it a good option for small businesses? Let’s find out. TurboTax isn’t cheap unless your needs are minimal (then the Free Edition will be fine). However, it’s one of the most user-friendly options on the market and strong customer support means using it is quick and painless. If you’re looking for a simple and effective tax software that you can use to file with confidence, TurboTax is a strong contender. TurboTax isn’t cheap. In fact, TurboTax is one of the most expensive options available to you as a small business looking for tax software. Although there are occasional offers to keep an eye out for, TurboTax Live (their flagship product) can cost you up to $199.99. That depends on what you can afford, how confident you are in your ability to file alone, what you would be doing with the time TurboTax could save you, what else you’d do with the money and the cost of alternatives like hiring a professional accountant. But even if you’re only a moderately successful business or freelancer, we feel this is an acceptable price to pay for the security that comes with a premium service. While there are cheaper packages – in fact, there is a Free Edition – we’re assuming that as a small business, you’ll be needing the features included in TurboTax Live. Small businesses and self-employed people can have more complicated filing requirements than employees, so you’ll want a premium service with your premium price-tag. Fortunately, TurboTax is easy to use, with a range of features that can help you save money and have confidence in the accuracy of your filing. Of course, with a range of packages available, the specific features that you receive will depend on which TurboTax package you chose. Suitable only if you need to file a 1040EZ or 1040A. Note that if you need to file state taxes, it’s not free. Comes with the ItsDeductible feature, allowing you to calculate the value of donated items. You can use the SmartLook support option and store your tax documents in TurboTax. A slightly upgraded version of Deluxe that gives you the ability to report investments and earnings from rental properties. All the above, plus help with your deductions and tracking your expenses. The real all-rounder. With TurboTax Live, you get help with virtually every IRS form and a one-to-one review with a professional prior to filing. You also get online tax advice from an on-screen CPA or Enlisted Agent. Since businesses often update their pricing and offerings, check out TurboTax’s website to make sure you’re up-to-date with their latest packages and prices. Once you’ve made your selection, you’ll find TurboTax is easy to use. Particularly valuable is the ability to work on your tax forms across devices, thanks to TurboTax’s cloud-based system. You can quickly access TurboTax from your mobile device when you find you have a moment free, and then easily resume where you left off when you’re back at your desk. You can also scan your tax-related documents and upload them seamlessly using your camera-enabled devices, saving time you’d spend manually typing information with less streamlined tax software. TurboTax has a quality display in the user interface and the tracking process. At a glance, you can see exactly where you are in your tax filing process. You can also answer short, simple questions in clear language that TurboTax uses to populate forms on your behalf. Knowing what’s going on is one of the greatest benefits of TurboTax. Does TurboTax have customer support? TurboTax comes with a lot of resources to help you out, even with the free version. This consists of a great online community, a searchable help feature, and even video tutorials. However, it’s with the paid versions that the support that TurboTax offers really comes into its own. 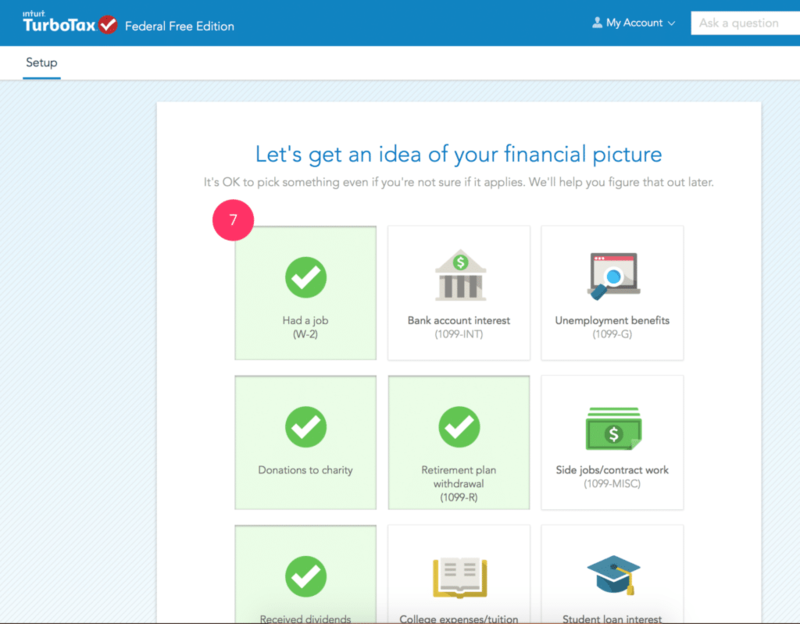 The SmartLook feature allows a TurboTax tax specialist to see what you’re looking at on your computer or mobile device, highlight areas you may need to fix and help you through the process. This feature is like enhanced customer support for paying customers. It’s worth remembering that Free Edition users don’t get this feature. TurboTax Live comes with an online one-to-one review of your tax information before you file with a qualified CPA or EA, as well as unlimited live support. It’s worth noting that it may not be necessary if you go for one of the paid but cheaper packages. The price difference is also worth considering. If you’re audited, TurboTax includes information on what to expect and how to prepare. This added help can be valuable guidance if you’re not a confident filer. However, it’s worth remembering that audit support from TurboTax doesn’t include defense. If you want to be represented before the IRS by a tax professional, you’ll need to pay for the add-on feature Max Assist and Defend, currentling $44.99.